Of course, the second half of the weekend looks fantastic. It's back. The sticky, steamy, muggy, humid air has returned to New Jersey. And just as we were getting used to a dry, comfortable atmosphere! That humidity will lead to some thick, uncomfortable air over the next couple of days, in addition to extra clouds and periods of rain. Blame Cindy for the humidity. Once a Tropical Storm, Cindy quickly lost its tropical characteristics as it moved inland over the NW Gulf Coast. Now, that tropical moisture is moving toward New Jersey. The most significant impact will be enhanced rain over the next 24 hours or so. As of this writing, a batch of rain is heading for New Jersey. That rain may be steady for a time Friday morning through early afternoon (1 p.m.). Then we'll get a break in the rainfall action, and might see a few peeks of of sunshine. However, sunshine can be a dangerous ingredient in moist air soup like this. With high temperatures peaking in the mid to upper 80s today, we'll have plenty of heat and humidity to spawn scattered thunderstorms. If they form, such storms could be on the strong side, with localized heavy downpours and gusty winds. Once again (and as usual), such impacts would likely coincide with the evening commute. Friday night is going to be oppressively muggy, as thermometers stay in the 70s through Saturday morning. Our approaching front will fire off one more batch of rain early Saturday morning. I think it's really going to pour, between about 5 a.m. and 10 a.m. Saturday. Between Friday and Saturday, a few spots in the Garden State could pick up 2+ inches of rain. And then? 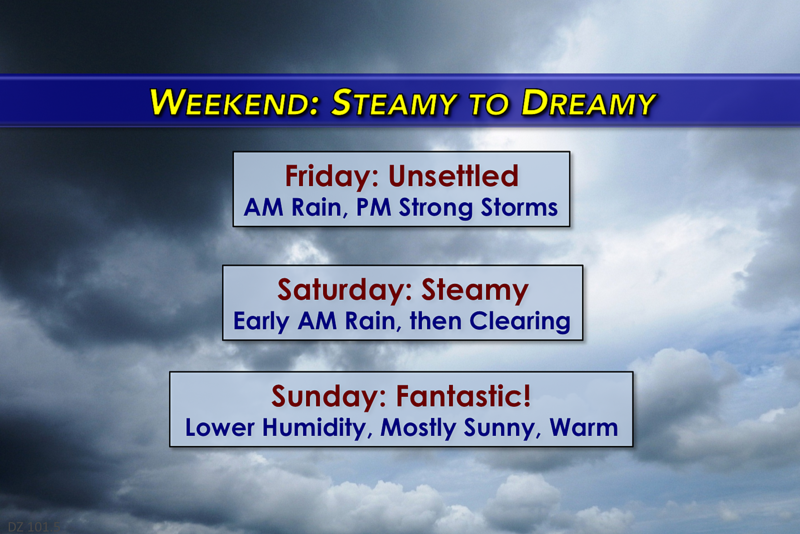 Skies will rapidly clear, with sunshine probably resuming by midday Saturday. The effects of the front — cooler, drier air — will not actually arrive until Saturday night. So the entire day will be quite steamy, with high temperatures near 90 and continued high humidity. Yup, it's going to feel like summer. By the time you wake up Sunday morning, dry air will have returned to the Garden State. That breath of fresh air will accompany seasonably warm temperatures in the lower to mid 80s, and a stiff westerly breeze up to about 20 mph. Skies will remain dry and sunny. Fantastic. Monday looks great too, with sunshine and highs near 80 degrees. Tuesday features one hiccup, with a few clouds and a chance of a shower. Thanks to high pressure building in, Wednesday and Thursday should be pleasant and comfortably warm (80 degrees, tops) too.